– while having a great time! At Gina’s Tennis World, we help you take your game to the next level. 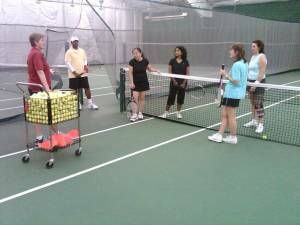 Whether you are returning to tennis from a long hiatus, looking to improve your current skills, or just starting to learn the game, we have an exciting adult clinic for you. You will hit more balls in an hour clinic than anywhere else in the country. Our unique classes use teaching rotations for individualized instruction within our clinics. We work with you on your specific development needs. Come work on your game, meet others at your level, and enjoy exercise and camaraderie on the court.